This article is based on a paper presented at the International conference on Pathways out of Terrorism and Insurgency: Comparative Analysis of Peace Processes, Castle of San Martino, Priverno, Italy, 10-11-12 of April 2003. This paper argues that the peace process between the Palestinians and Israel, which began somewhere in the middle of the 1980s, after the Palestine Liberation Organization’s (PLO) debacle in Lebanon in the 1982 war, has been hampered and sabotaged constantly by the policies of its leader Yasser Arafat, who never truly and sincerely renounced to terrorism in order to advance the strategic goals of the Palestinian people, as he perceived them. It is true that strategic mistakes and short-sighted policies of the Israeli leaders, from the left and from the right, as well as the destructive consequences of the terrorist strategies of Palestinian radical leftist and Islamist organizations opposed to the peace process have had their part in the failure of the peace process, but in this author’s opinion the lion’s share for the present tragic situation of the two peoples belongs to Arafat. Historically, the PLO under the leadership of Yasser Arafat has used two strategies in the framework of its armed struggle: terrorism and guerrilla warfare. Terrorism, either terrorism inside Israel and the occupied territories, terrorism through the borders (mainly form Jordan and Lebanon since 1965) and especially the international terrorism since 1968 has brought the organization a series of strategic victories: the forging of a Palestinian national identity, the transformation of the Palestinian plight into an important issue on the international agenda, vis-a-vis the public opinion, the various governments, and the United Nations; diplomatic recognition, first by the Arab states and then by many other nations. By contrast, the various attempts of guerrilla warfare have been always defeated, even when they seemed to reach the peak of PLO’s successes: the attempt to open a guerrilla war in the West Bank in the autumn of 1967, after the Six Day War, which ended after several months as Israeli military and security forces threw out Arafat’s meagre troupe; the attempt to take control of the Hashemite Kingdom of Jordan in September 1970, which led to the Black September massacre of thousands of Palestinian fighters and civilians and the expulsion of the PLO forces from Jordan; the across the border terrorism, guerrilla and artillery warfare from the extraterritorial enclave of Fatahland in southern Lebanon, which resulted in the Israeli war on Lebanon in 1982 and the expulsion of Fatah/PLO forces not only from South Lebanon, but also from Beirut, and their ensuing expulsion from northern Lebanon by the Syrian army. But nothing of this violent activity has brought negotiation with the enemy or Israeli recognition. The event that had the greatest impact on Palestinian, and particularly Fatah policy, has been the outbreak of the intifada (the Palestinian uprising in the West Bank and Gaza) in December 1987. Its political impact in Israel and the Arab world, as well as renewed efforts by the American administration to revive the peace process, confirmed to the leaders of the PLO that international terrorism could harm their long-term political and strategic interests. Actually, the intifada and not Palestinian terrorism was the main trigger to the Israeli acceptance of negotiations some years later. In a declaration published in May 1989, Arafat declared that the paragraphs in the Palestinian Charter calling for the destruction of Israel were “null and void” (caduc, as he put it in French), and that the PLO advocated a two-state solution. 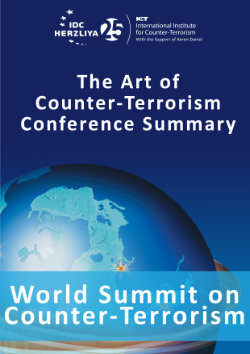 This apparent moderation of its political position and the rejection of international terror made political dialog with the American administration possible. But in May 1990 the Popular Liberation Front (PLF), a group member of the PLO, whose leader Mohammed Abu al-Abbas was a client of Arafat, waged a failed sea borne attack against the Tel Aviv beach and the US suspended the dialog. (the same group was responsible for the famous hijacking of the Italian cruise ship Achille Lauro in 1985). Arafat did nothing to punish Abu al-Abbas and the American administration ended the political dialog with the PLO. Any hope of reviving the dialog with the US was shattered by the clear alignment of the PLO and Arafat on Saddam Hussein’s side after the Iraqi invasion of Kuwait in August 1990. After the American-led coalition victory in the Gulf War, the US sponsored the Madrid conference in October 1991 and the first negotiations in Washington with the participation of representatives from the West Bank and Gaza, actually representing a weakened PLO. The talks, based on the Baker plan, focused on interim arrangements for Palestinian autonomy in the territories. This convinced Arafat to engage direct secret negotiations with the new Israeli government of Yitzhak Rabin, which led to the Oslo peace accord of September 1993. In July 1994 Arafat arrived in Gaza to take control of the newly established Palestinian Authority. The great question at that moment, question which seems today to have a clear response, was if Arafat and the PLO where indeed sincere in accepting the agreement and its stipulation that “disputes arising out of the application or interpretation of this Declaration of Principles or any subsequent agreements pertaining to the interim period, shall be resolved by negotiations”, implying that violence and terrorism should never again be used to further political goals. Today it is publicly known that Arafat arrived to Gaza in a Mercedes, sitting on somebody whom he was smuggling in – Jihad Amarin – and Mamduh Nofal, the former military commander of the Democratic Front, was hiding in the trunk. They also had a few Kalashnikov rifles and night-vision equipment in the car. Was this a bode for the future? The Israeli authorities did nothing in reaction to this rude behavior of Arafat from the first moments of the implementation of the Oslo agreement and the incident was leaked to the media only some years later. The Hamas and Palestinian Jihad suicide bombings began already in April 1993, but they peaked after the Oslo agreement, in January-July 1995, during the late Rabin’s government, which considered them, for the first time, a strategic threat to the peace process. The assassination of Rabin by a Jewish religious extremist in November 1995 on this bleak background and the ensuing spate of five consecutive suicide attacks during February-March 1996, after Israel killed Yehia Ayyash, the operational leader of the Hamas terrorist branch, provoked the fall of the Peres led Labour government and the slowing of the peace process during the Netanyahu led Likud government. Arafat did practically nothing serious to stop this series of bloody bombings, besides a temporary agreement with the Hamas leadership to play down the terrorist activity. Hamas’ spokesman Ibrahim Ghoushe declared in March 2001: “In 1995 a senior PA envoy came to meet Hamas leadership and asked it to stop armed operations so as not to affect the negotiations process and the expected results of restoring lands. We told him: We were not on a collision course with the Oslo march and we will not stand in your way but will focus our operations against the Zionist enemy. Hence you do your own work, if you think that Oslo would restore the lands, and let the resistance do its own” (author’s emphasis). Unfortunately, neither the Peres government did react strongly against the PA, on the political level, after the first bombings by Hamas. Only the pressure of the Netanyahu government and the massive effort of Israel’s security forces, with a limited cooperation from the Palestinian security apparatuses, managed to curb seriously the Hamas and PIJ terrorist activity between 1997 and 2000. The Barak government seemed to be on the good path for a final peace agreement as it withdrew unilaterally from South Lebanon in May 2000 and made a generous proposal to the PA at Camp David in July 2000. Arafat and the PA did not accept to compromise on two essential issues, the status of Jerusalem and “the right of return” of the Palestinian refugees and preferred to return to the old days of the armed struggle, back to terrorism and a debut of guerrilla warfare renamed with a new religious flavor “the al-Aqsa intifada.” The decision to wage the violent war of attrition against Israel was apparently taken before the Camp David talks. What triggered the “Al-Aqsa intifada”? In a speech delivered before the Camp David talks at the opening of the First Founding Congress for the Fatah Movement in the Nabulus province Arafat threatened to rekindle the intifadah inside the Palestinian territories He said everyone should remember the Al-Karamah battle, the Beirut battle, and the seven years of intifadah, which are renewable. Contrary to the first intifada of 1987 - 1992 which was a real spontaneous popular uprising, quickly bandwagoned and controlled by the PLO and the newly emerging Hamas, the so-called “al-Aqsa intifada” of September 2000 was a premeditated violent campaign against Israel tainted by strong religious connotations intended to rally around it not only the Palestinians but also the Muslim world at large. The violence was initiated by Chairman Yasser Arafat when he realized that the Camp David summit could not deliver the kind of agreement he dreamt of - the establishment of a Palestinian state in all of Gaza and the West Bank with Jerusalem’s Old City as its capital without renouncing the “right to return” of the Palestinian refugees and signing an agreement proclaiming the end of the conflict. The events have revealed a two-fold strategy: on the one hand, the “lebanonization” of the conflict in the Territories, on the other, an attempt to drag the Arab countries into a conflict with Israel for the liberation of Palestine - beginning with economic conflict and possibly progressing to a full-scale military conflict. This strategy explains the widespread use, during the first months of violence, of children and young people in the first ranks of the fighting irregular forces challenging the Israeli army forces, which were intended to give to the new intifada the “popular” flavor it never achieved. This explains also the high number of civilian casualties, mainly young people, victims of a strategy that led only to the escalation of violence, a cycle of suicide bombings-retaliations-suicide bombings and so forth. In April 2003 the statements of the arrested Fatah leader Marwan Barghouti were published in Israel. “When Yasser Arafat wanted a cease-fire, he would say so, and when he remained silent, it was understood as a green light to continue terror attacks,” stated Barghouti. The Fatah leader also said Arafat never asked him directly to carry out attacks. The same night Arafat appeared at a public rally asking his fellow Palestinians to sacrifice “a million shahids (martyrs) in the way to the liberation of Jerusalem.” Everyone in the Palestinian society understands that the shahids are also suicide bombers. The various nationalist and leftist Palestinian groups, members or outsiders of the PLO, always opposed a peace with Israel (only the Popular Democratic Front for the Liberation of Palestine adopted a more subtle and realistic policy). The Islamist organizations, the PIJ and Hamas, which began their terrorist activity in the middle of the 1980s, preached loudly the destruction of Israel and the transformation of Palestine into an Islamic state. yes"
In October 1991, parallel to the Madrid conference, the Iranian regime organized a conference in Tehran at which all the Palestinian Islamist and leftist organizations, and also Syria, participated. At the conference it was decided to make every possible effort to sabotage the new born peace process, that was seen as a direct threat to the strategic goals of the participants, all of which professed the destruction of Israel. As a result, Hamas and the Palestinian Islamic Jihad (the PIJ is in fact an Iranian proxy terrorist organization), enhanced their terrorist activity in the territories and inside Israel. The Rabin government decided then in 1992 to expel 415 members of the two organizations to Lebanon. However, the Israeli High Justice Court ruled that they had to be permitted to return after two years and indeed they returned after the Oslo agreement was signed. Unfortunately, during their stay in southern Lebanon they learned form the Hizballah and Iranian agents how to use suicide bombings and this they indeed did by 1994. During October – December 2000 the co-operation between the Hamas and the PA. was strengthened, particularly with the Fatah and the Tanzim leadership, within the framework of the Supreme Committee for the Supervision of the intifada, which was called “The National-Islamic Committee,” which includes all 13 organizations active in the PA (Fatah, the leftist organizations and the Islamic organizations). The cooperation with the Tanzim and the Fatah in the field is stronger and more intimate and these bodies are considered allies not only against the suppressive action taken by the Israelis but also against the “defeatist” trends in the PA leadership and the corruption in its ranks. Their joint publications attack the attempts to revive the dying peace process or the PA – Israeli security co-operation. It should be noted that Fatah’s al-Aqsa and Tanzim militants began to use suicide terrorism the moment their leaders felt, after a year of unfruitful efforts, that the Hamas has taken the lead in popularity on the Palestinian street. Arafat does not see Hamas as a rival or as an adversary, but a junior partner. Arafat’s legacy is the combined structure that he allowed to emerge during the intifada, an informal alliance, and now formal, among his own Fatah faction, Hamas, and the rest. The essential difference between Arafat and Hamas’ leader Sheikh Yassin is that the former sees in the intifada a tool to advance political and territorial aims within the framework of the peace process, whereas Yassin views the Palestinian uprising as a support for the resistance struggle as the only strategic option. On January 1st 2000, “Fatah Day,” Hizballah secretary-general Hassan Nasrallah, in an interview to the Palestinian Authority’s newspaper, Al-Ayyam, advised the Palestinians to initiate an intifada and guerrilla war against the Israelis, based on Hizballah’s example and promised to support the Palestinian struggle in the refugee camps in southern Lebanon. Six months later, the hasty unilateral withdrawal by the IDF from South Lebanon has indeed instilled enormous hopes in the Palestinian population that the same scenario is achievable in their conflict with Israel. This has encouraged them to imitate the strategy and tactics that seemed so successful in bringing about an IDF withdrawal. After the quick American victory in Afghanistan and the evaluation that the U.S. will turn to deal with the other rogue organizations and states of the “axis of evil”, the Hizballah leadership, in coordination with Syria and Iran, decided by the end of 2001 to enhance its confrontation with Israel by actively supporting the Palestinian intifadah, and to escalate the tension in the region in an attempt to obstruct further American action against Iraq. Subsequent events during 2002 point towards this conclusion: The involvement of senior Hizballah operatives in the Karin-Atwo weeks before ship affair of smuggling of heavy weapons in January, and the attempt to smuggle katyusha rockets through Jordan at about the same time, in order to fuel the Israeli-Palestinian conflict; the 12 March 2002 attack by Hizballah-backed Palestinian infiltrators on civilian vehicles in northern Israel, which killed five civilians and one IDF soldier, the deadly Hamas suicide bombing at the Park Hotel in Netanya on the Pesah night and the consequent IDF Defensive Shield Operation;. the 30 March through 13 April Hizballah heavy mortars and katyusha attacks against the IDF positions in the North of Israel represented the peak of Hizballah’s attempt to stop any appeasement in the Israeli-Palestinian conflict, on the one hand, and to destabilize the region, on the other. It seems Arafat has not learned the lessons of his own history and has again embarked on the road of terrorism and a feeble guerrilla warfare hoping to use the PA territory and the paramilitary forces at his disposal under the cover of a so called “popular intifada”. 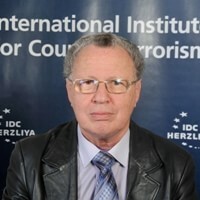 The escalation of violence and terrorism during the last two years and a half have been a series of miscalculations and wishful thinking on the part of the Palestinian leadership and the radical terrorist organizations, which has provoked more than two thousand victims among the Palestinians and more than 800 among the Israelis, and led their people on the brink of a new “nakba” (catastrophe). More gravely, it has increased the hatred between Palestinians and Israelis and produced a chasm of mistrust between the two peoples which it will be very difficult to bridge. Perhaps the gravest and most significant dimension of the Al-Aqsa intifada is that they show that the Palestinian Authority sees the use of unbridled violence as a legitimate and effective means of advancing its objectives. In this way the Palestinians have undermined the basic concept of the peace process, which was not resorting to violence as a means to achieve political goals: these should have be achieved through negotiations at the negotiating table, not through violence and terror. I will state very simply and frankly that I think there is no prospect of reform - meaningful reform, good governance, and good negotiation and good peace with Israel under Yasser Arafat. This is my view. I think he is responsible for bringing about immense damage to his own society, to the social fabric of the Palestinians, and not just to the structure and foundations of the economy. I think that it is criminal what has happened and what the Palestinian leadership has allowed itself to do . Hopefully, the new Palestinian government led by Abu Mazen, and the new strategic conditions and environment as a result of the success of the American led coalition in Iraq will bring the necessary change for the end of terrorism and violence which will permit the renewal of the negotiations and the achievement of the so much needed peace agreement between the two suffering peoples, the Palestinians and the Israelis. All parties - Israel and the PA primarily - should adopt peace as a strategy. The PA has failed to understand what this strategy means operationally - that is, the necessity of developing an entire set of political tools, responses, and behavior that work toward a lasting peace. Arafat has been deeply implanted in Palestinian politics during the past thirty years, yet he has been weakened much by the intifada; he ushered in a new phase that has outgrown him. In any post-Arafat scenario, it is still not clear whether anyone would be able to assert overall control and authority over the military, the administration, and the various factions of the PLO; such stability is required if negotiations with Israel are to take place. If the process of transition takes places under the present conditions of violence, the emerging Palestinian political system and social structure could take a violent turn under rival warlords. If the succession process occurs during peaceful times, however, it will likely be smooth and straightforward, producing a kind of collegiate replacement leadership. Neither the attack against three Fatah activists in Cyprus in February 1988 nor the assassination of Khalil al-Wazir (Abu Jihad) in Tunis in April of that year triggered a PLO retaliatory response, despite the fact that Israel was accused to be behind these incidents. The proceedings of the Fatah Fifth Conference stated that the “intifada has occasioned a deep rift within the Zionist entity, directed world attention to the justice of the Palestinian cause, and imposed a new political reality, with repercussions at the Palestinian, Arab and international level.” For proceedings of the conference, held on 8 August 1988, see Journal of Palestine Studies (JPS), Vol. 19, No. 1 (73) (1988), pp. 134-9. See Arafat’s interview with the French TV1 network, as quoted in JPS, Vol. 19, No. 2 (74) (1990), pp. 144-6. Khalidi, in analysing the resolutions of the nineteenth Palestinian National Council (PNC) of November 1988 declaring the establishment of an independent Palestinian state, emphasized that for the first time in the history of the PNC, the proceedings made absolutely no reference to the “Palestinian Charter” or the “armed struggle” that was so central to the organization’s ideology. Nor did it demand that its forces in Lebanon be allowed freedom of action against Israel. Instead, it announced renunciation of terrorism in all forms. Khalidi pointed out that these two themes still appeared in the proceedings of the eighteenth PNC of April 1987. See Rashid Khalidi, “The Resolutions of the 19th Palestine National Council”, JPS, Vol. 19, No. 2 (74) (1990), pp. 35-9. See interview with Lebanese newspaper Al-Mostakbal March 14, 2001 as published by the Hamas website http://www.palestine-info.co.uk. On his way to Kuwait, where he later died of a heart attack, Faysal Al-Husseini gave what turned out to be his last interview to a Nasserite daily. See Al-Arabi (Egypt), June 24, 2001 as cited in MEMRI, Special Dispatch No. 236- PA.
 For this subject see also Yigal Carmon and Yotam Feldner, “The Intifada of Al-Aqsa”, MEMRI, Inquiry and Analysis Series - No. 42, October 11, 2001. See Jerusalem Al-Quds, 26 June 2000. The PA daily Al Ayyam has published excerpts from the book. Ramallah Al-Ayyam, December 6, 2000. See ‘A Fatah Official on the Intifada and its Goals,’ MEMRI, December 15, 2000. This second aspect of Arafat’s strategy is not, in fact, new. Fatah, Arafat’s staging ground before he became chairman of the PLO, opened its terrorist campaign against Israel at the beginning of 1965 with the aim of implementing what Arafat himself, in his first public interview, called as “the entanglement strategy.” This involved using sabotage across the borders in order to force Israel to adopt a retaliatory policy against the Arab countries from which the Palestinian attacks were launched. This would in turn force the Arabs to step up their military preparedness. This cycle of action-retaliation-reaction was meant to lead to a gradual escalation of tension on the borders, and eventually all out war against Israel. The Syrian military activity against Israel in the contention over the sources of the Jordan River, and Egypt’s unhappy decision to deploy its troops in the Sinai did indeed trigger the Six Day War in 1967, but with disastrous consequences for the Arab armies and governments. See Al-Ayyam, October 3, 2000 as cited in Yigal Carmon and Yotam Feldner, The Intifada of Al-Aqsa. For this subject see Don Radlauer, An Engineered Tragedy: Statistical Analysis of Casualties in the Palestinian - Israeli Conflict, September 2000 - June 2002, 20 June 2002 at http://www.ict.org.il/Article/840/An-Engineered-Tragedy. See Ehud Ya’ari, “Arafat’s Strategy - Impose an Intifada, Spillover to The Arab World,” Peace Watch No. 293, The Washington Institute for Near East Policy, November 7, 2000. See Saleh Abdel Jawad, “The Intifada's Military Lessons,” published October 25, 2000 at http://www.jmcc.org/media/reportonline by the Palestine Report. The comments were from a transcript of Barghouti's Shin Bet interrogation, portions of which were released for publication by the Tel Aviv District Court. See Haaretz, April 8, 2003. For a discussion of Hamas’ terrorist strategy prior to September 2000, see Ely Karmon “Hamas’ Terrorism Strategy: Operational Limitations And Political Constraints,” MERIA Journal, Volume 4, No. 1- March 2000 at http://www.ict.org.il/Article.aspx?ID=773. Arafat grew up in the Moslem Brotherhood. He was expelled from Egypt by President Nasser in 1957 as a Moslem Brotherhood activist, together with the late Abu Jihad. See Ehud Ya'ari, “Arafat's Quasi-Intifada,” AIJA website, August 2002. See Ely Karmon, Arafat’s Strategy: Lebanonization and Entanglement, 16 November 2000, at http://www.ict.org.il/Article.aspx?ID=794. See Ehud Ya'ari, Arafat's Quasi-Intifada. ”Palestine – Where To?” PASSIA Roundtable Meeting and Discussion, 9 July 2002, at http://www.passia.org/meetings/2002/round0907.htm. See Yezid Sayigh, “Palestinian Israeli Dynamics And The Future Of Palestine,” Peacewatch, The Washington Institute for Near East Policy, No. 363, February 11, 2002.